Cambridge Analytica harvested personal information from a huge swath of the electorate to develop techniques that were later used in the Trump campaign. The New York Times has just published a story about How Trump Consultants Exploited the Facebook Data of Millions. 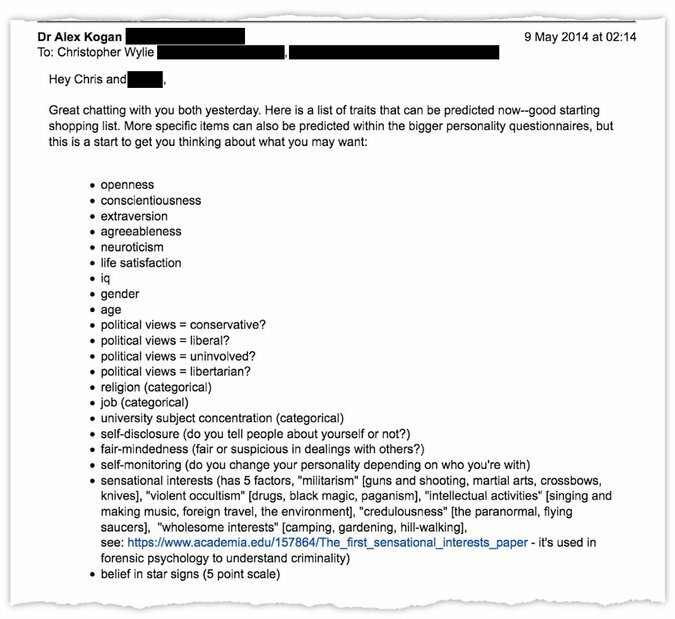 The story is about how Cambridge Analytica, the US arm of SCL, a UK company, gathered a massive dataset from Facebook with which to do “psychometric modelling” in order to benefit Trump. What is new is that there is a (Canadian) whistleblower from Cambridge Analytica, Christopher Wylie who was willing to talk to the Guardian and others. He is “the data nerd who came in from the cold” and he has a trove of documents that contradict what other said. The Intercept has a earlier and related story about how Facebook Failed to Protect 30 Million Users From Having Their Data Harvested By Trump Campaign Affiliate. This tells how people were convinced to download a Facebook app that then took your data and that of their friends. It is difficult to tell how effective the psychometric profiling with data is and if can really be used to sway voters. What is clear, however, is that Facebook is not really protecting their users’ data. To some extent their set up to monetize such psychometric data by convincing those who buy access to the data that you can use it to sway people. The problem is not that it can be done, but that Facebook didn’t get paid for this and are now getting bad press.